GBPI has partnered with Susan Whittington to complete a website for her mom’s, Lyn Snow, Watercolors. LynSnowGallery.com Visit the website and take a look a the online store of Lyn Snow Watercolors – the Gallery is wonderful. This project was both fun and a maze of discovery. The art work is sensational and Lyn’s story is incredible. Many stories of her travels as well as her untimely passing away from a rare tick disease. Visit LynSnowGallery.com for the full story. Here is a story from Susan about her Mom. Lyn Snow was my mother, who lived and painted in South Thomaston, Maine. She was known for the clean lyrical approach she brought to her watercolors. She captured and painted the mood and essence of flowers; the elegance and romance of a wedding bouquet, the charm of wildflowers and the drama of irises. Individually or in collection, her work gained national recognition. Her originals and limited & open edition prints have been shown widely at fine art shows, numerous local and regional galleries both in the U.S. and internationally. Lyn collected many awards over the many decades she painted. World renowned artist Andrew Wyeth once visited the Gallery, and after watching Lyn paint, remarked “you have great technique”. What started as a small art studio grew into a sprawling family business. The old farm house doubled in size to incorporate a large and busy studio and frame shop. For many years Lyn had her own galleries in Portland and Rockland, Maine. Over the years she & her husband Jack reduced (and then eliminated) travelling to the art shows, and then closed the Portland store. She officially retired on Columbus Day 2013, the final day of the Rockland store. Her plan was to be a full time grandmother. In November of 2013 Lyn was bit by a tick carrying the Powassan Virus, thus passing away in December of this same year. While she is missed by family, friends and art collectors, her work is still available to grace the walls of those who enjoy her work. GBPI welcomes Sydney Hill LLC.com on board. Robert Racine and Sydney Hill LLC. asked that we create a web presents for his organization. We are proud to be working with Bob and his crew. They offer two main services, Insurance Estimating for both Commercial and Residential properties, as well as Home Inspections and Construction Consultants. We are a Maine firm specializing in Insurance Estimating for both Residential and Commercial Insurance. If you are in need of an Insurance claim estimate or appraisal, we are the company for you. Our Residential and Commercial Insurance services extend from Maine, New Hampshire, Vermont, Massachusetts, and Connecticut. Helping you out with damage caused by, Fire, Water, Windstorm, Explosion, Lighting Freeze up, Smoke, Ice Dams as well as Damage by vehicles. So when a disaster strikes, call for an appointment so that we may help you. You can also complete our online form. Umpire Appraisal Service – when you need an Insurance Appraisal Umpire in Maine, New Hampshire, Vermont, Massachusetts, or Connecticut, call Sydney Hill LLC., or fill out our online form and we will assist you. Please join the team at GBPI and Culbert Professional Investigations Group in a strong welcome on board! One of our clients and GBPI attended a Veteran Function at the August Elks #964. Girard, CEO of V&G Home Improvements, donated to the Travis Mills Foundation. The event was a great success in raising funds for the foundation. 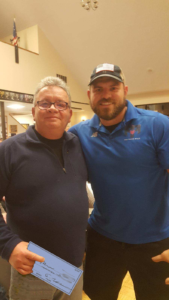 Pictured with Girard is Travis Mills, Retired United States Army Staff Sergeant Travis Mills of the 82nd Airborne and founder. Gold Bridge Partners, Inc supporting Veterans and a member of the Augusta Elks.